When Three Points of the Compass started out camping as a teenager there was never any real fuss made as to what torch to take. Presumably because there was little in the way of choice. I took a small plastic Eveready battery powered, hand held torch. To my recollection it did perfectly well. I burnt a hole through the case with a metal skewer heated over the kitchen gas ring when my mother wasn’t watching and passed a piece of string through. This provided a hands free capability. I do not recall what happened to it, it probably fell to bits. 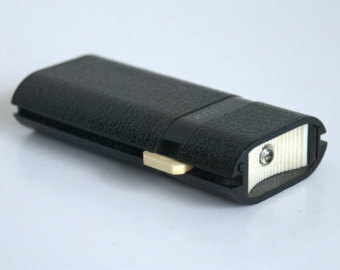 Later, in the army, it was the ubiquitous green plastic right angled torch with metal pocket clip. The end cap unscrewed and contained a spare bulb below the spring. Some also had another cap that could be removed, this contained four lens filters of different colours. In the late 1980s I had a brief period with the Post Office where I was reintroduced to the same torch, only this time it was the civvy version, there were no lens filters and it was red plastic. Needless to say, examples of each found their way into my outdoor kit of the time. I don’t really recall when choice of lighting became the supposedly important factor that it is now today. Possibly torches, lamps and lanterns are a victim of very successful PR campaigns for a product that can be produced to suit just about anyone’s pocket. None of those that I use now were that expensive but every single one is a decent product, just as many of the dozens of others that I don’t possess are. Again, it comes down to personal choice and buying and using what suits the walk in question. A word of warning, many manufacturers will quote run times at specific lumens, I quote some of those hours here. But some lights will dim considerably within that specified time. You can change the battery and it is astonishing at how much brighter the beam suddenly becomes. This little headlamp was a bit of a game changer when it came out. Flying in the face of ever stronger beam torches being produced, this has quite modest ambitions, and as such, it succeeds admirably. I have the earlier model that came in a small red, plastic case that protects from all but the worst of rain and bumps. The case weighs 18g and can easily be left at home though I keep my lamp in the case as it is easier to find and keeps all of the twiddly thin headband in place with the lamp itself. The lamp itself weighs 28g with two CR2032 batteries fitted. These only weigh 3g each so a couple of spares can easily be included in a pack. The batteries have a ten year life. The lamp can be put around the head or clipped to hat brims, inside of the tent, map edge or book pages, or simply stood up. The beam options are easily determined via the sliding red lever on the face- White beam has Maximum, economy and flashing modes, Red beam has permanent or flashing options. At maximum white beam, it is rated at 16 lumens (newer model 26 lumens) or 5 lumens on economy setting. The clip to adjust the headband has a whistle built into it. Battery life is 35 hours (apparently 55 hours on newer model) on the maximum white beam setting but can be extended to 45 hours (70 hours on newer model) on economic white beam mode. This is a lovely little lightweight headlamp that is very often taken out on day hikes ‘just in case’. A recent just in case scenario was a bit of road walking when completing the Esk Valley Way, the weather was atrocious and visibility was dire. I clipped this to the rear of the pack with the red beam on flashing mode. The thin headband on my model has been replaced on newer models by an integrated retractable Zip cord. I think I’ll stick with mine. In a nod to the use of portable chargers to keep electronics working and a (partial) move away from disposable batteries, my most recent headlamp purchase has been a Black Diamond ReVolt. 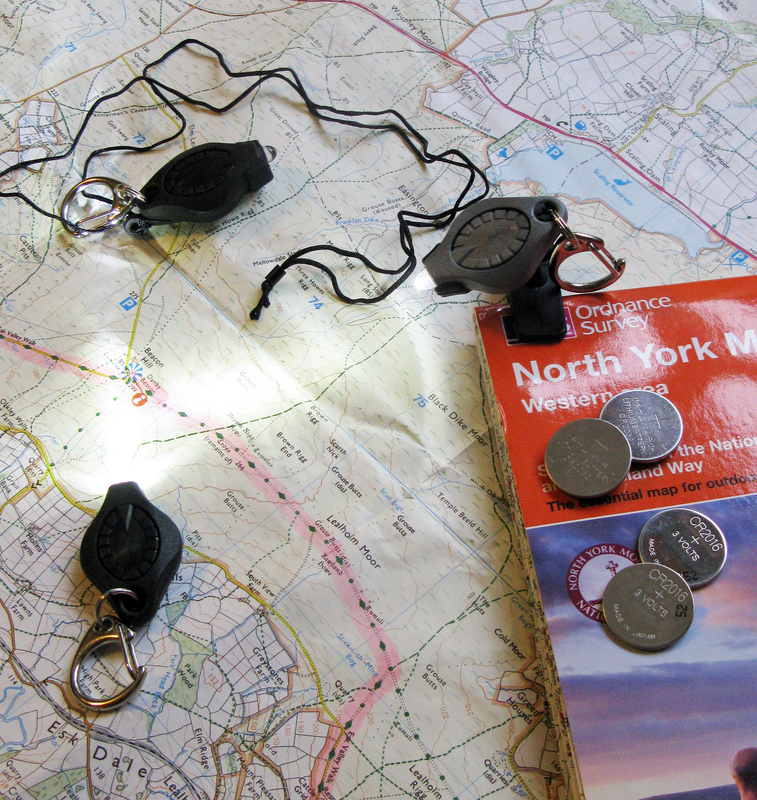 This lamp weighs 101g, with three Black Diamond NiMH 1.2v rechargeable AAA batteries fitted (13g for each battery). It has a maximum beam of 130 lumins (with alkaline batteries). However there are also various beam settings built in: full strength in proximity and distance modes, dimming, strobe and red night vision option. I like being able to switch between flood and spotlight modes. It can also be used with standard AAA alkaline or lithium batteries instead of the rechargeable batteries supplied with it. The power level meter is also useful to warn of decreasing strength in the batteries. This shows green for >50% remaining power, orange for 25-50% and red for <25%. Various LEDs are fitted, one triple power, two single power white and two single power red LEDs so any (unlikely) bulb breakages will not affect being able to see. The charge lead is 550mm long and weighs 20g. 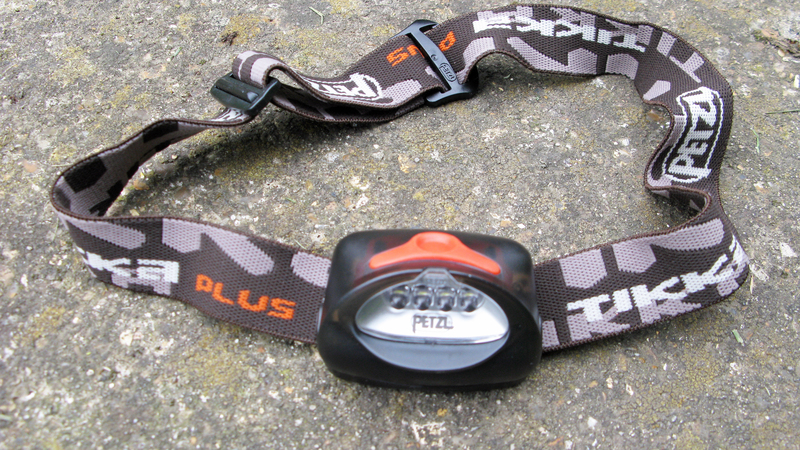 This is a great headlamp, it has the battery life, power and beam options that I want. I cannot see me making a change from this lamp for some years. 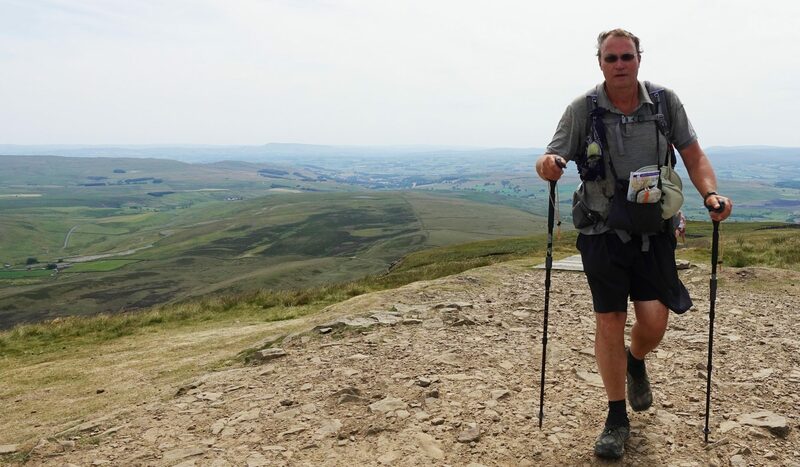 While not the lightest of options out there, the rechargeable facility, utilising the short charge lead, is an effective solution both for day hikes, taking torch alone, or longer trips taking the lead and charger as well. 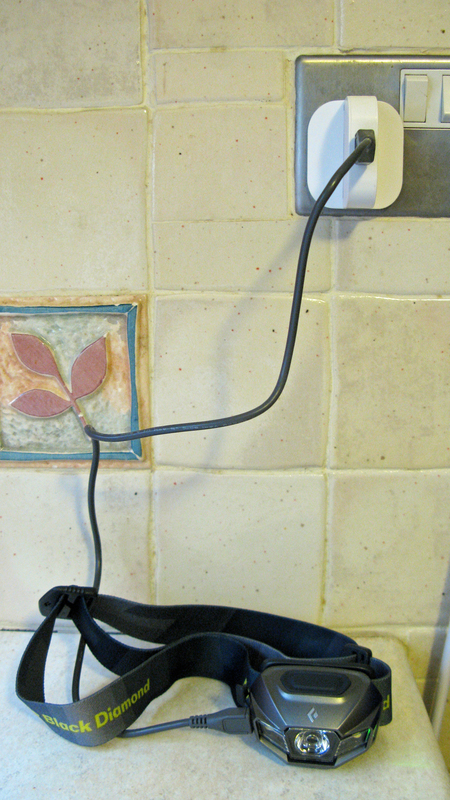 The lead is also compatible with a Kindle. Despite the manufacturer stating that it cannot be done, it is an interesting option that the torch can also be used to charge other rechargeable AAA NiMH batteries for use in other devices, not that I have any in mind at present. 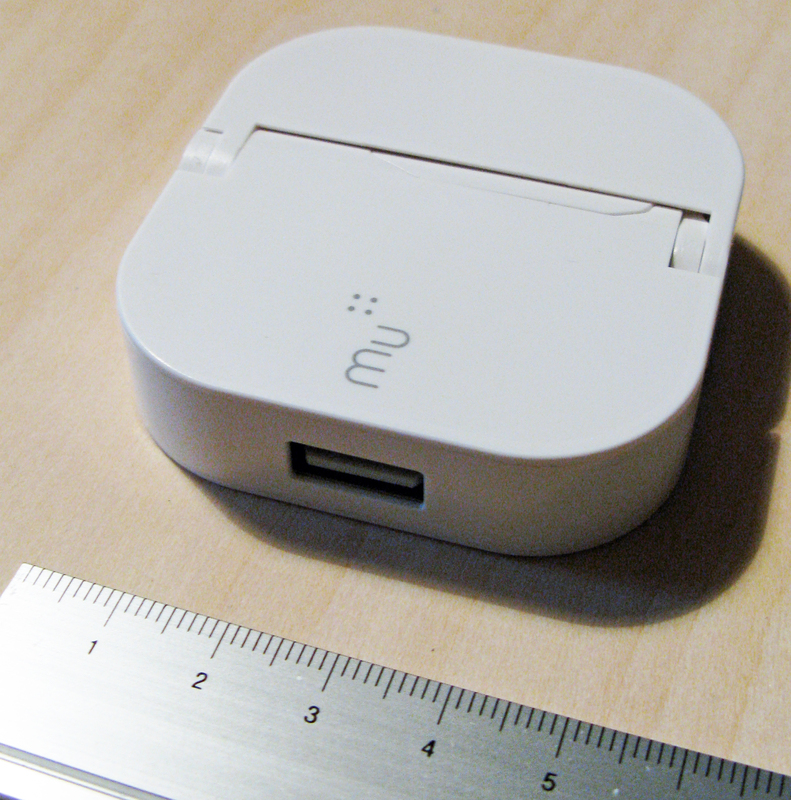 The best USB plug solution I have found for use with this is a Mu Classic USB folding plug which weighs 42g. It measures 60mm x 55m x 14mm when folded and has an input of AC 100-240v, 50-60Hz and an output of DC 5v 1Amp. There are also 2.4Amp output and two USB port variants available. Photon Freedom Micro torch. Also shown is the neck lanyard and magnetic clip with swivel head. Manufactured by Laughing Rabbit Inc. (LRI) the Photon Freedom Micro torch is not a toy or gimmicky little keyring device. Though they can certainly be used simply as such. There are similar little torches out there, even this company produces simpler and cheaper torches, but the Photon Freedom Micro is the real thing. The case is made from glass-filled polyurethane and is virtually indestructible, the LED bulb is almost unbreakable too. The company upgraded the LEDs (white is now Nichia GS LED) a few years ago and the current white model version knocks out up to 4.5 lumin, which isn’t a great deal, but suffice for most needs. There a number of body colours, I have the black and the grey (platinum), there is also a ‘covert’ body that provides a narrow directed beam. Different LED bulbs are on offer too: White, Orange, Red, Yellow, Green, Turquoise, Blue, Purple (blacklight), Ultraviolet and Infrared. I use the white and red beam variants. Not only does the red save night vision but the battery life is doubled as well. Annoyingly though, the two take different types of battery. 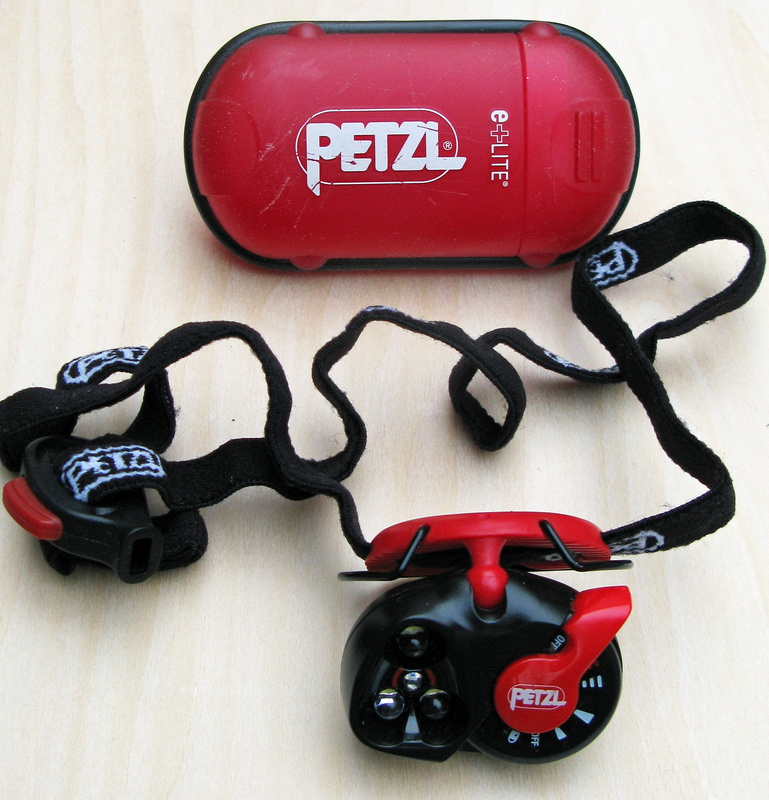 The red light version takes one CR-2032 lithium battery, the white light version takes two CR-2016 lithium batteries. Though you can swap out the two for the one at the expense of brightness. I purchased a black key ring for use with the red torch (to signify night vision use) and the standard silver ring for the white torch. I clip one red and one white onto zip pulls on the pack for convenience. I may one day be tempted to purchase a yellow bulb variant, not only does this preserve night vision but lights the way better than red while still having an extended battery life. Battery life for the white light is up to ten hours but can easily be extended by not using at full brightness. These torches are cheap enough and useful enough that I might also try out the Doug Ritter version from a few years ago, this has a nozzle to better direct the beam with less scatter and a bright yellow body to enable these tiny little torches to be found more easily when dropped. There are a number of modes that can be activated on these torches. These are Morse code, Slow Beacon, Medium Beacon, Fast Beacon, S.O.S. or constantly on. The desired brightness can be set to anything from dim to fully on. Anything less than full brightness is extending the battery life. Weights are negligible, there really isn’t any excuse for including one of these as part of a gear list. Even on a day walk there is the odd occasion when somewhere dark and dank needs to be explored. Just about any of those hand torches and headlmaps listed above can be used in a tent. Occasionally it can be useful to have something a bit chunkier. I have found the two lights below to be of use on occasion, though they are probably more suited to car camping or longer, colder nights in the shoulder seasons or winter camping. This is a bit of ‘old school’ technology. But I believe these candle lanterns still have a place today. The one I have is the Original Candle Lantern + LED. You can see the LED in the base of the lantern in the picture above. The LED is nothing special, it is powered by two CR2032 batteries which last some 40 hours and the light can be removed and stood up for use. The rest of the lantern, the main part, is powered by… candle. The design and build of these lanterns is very simple- an aluminium metal body with a slide down-able glass surround/chimney to the candle (don’t get wax on it), the candle is inserted from the bottom and is pushed up as it burns by a thin simple spring. There really isn’t anything to go wrong on these. 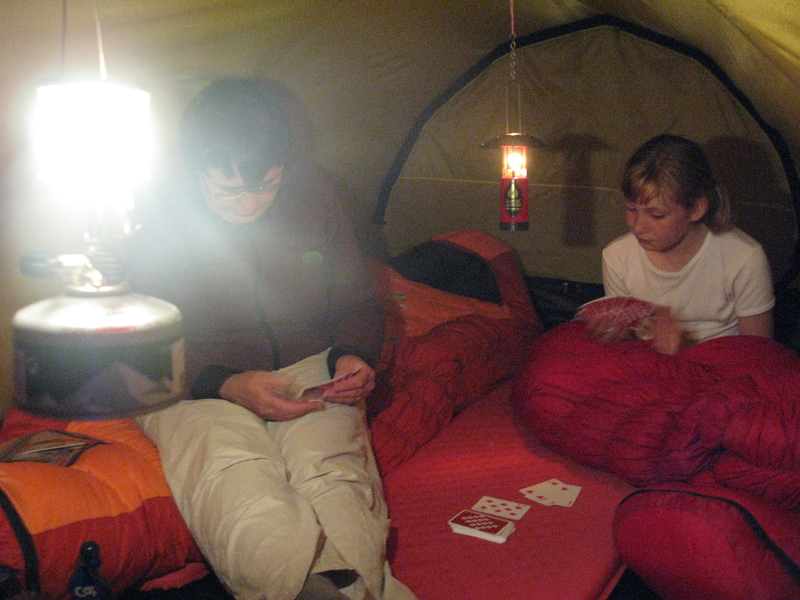 They certainly knock out some heat, a small tent is easily warmed by five degrees or more. Also the light from a candle is something to enjoy, the flickering light touches something inside I think, reminiscent in a small way to watching the flickers of a wood fire. 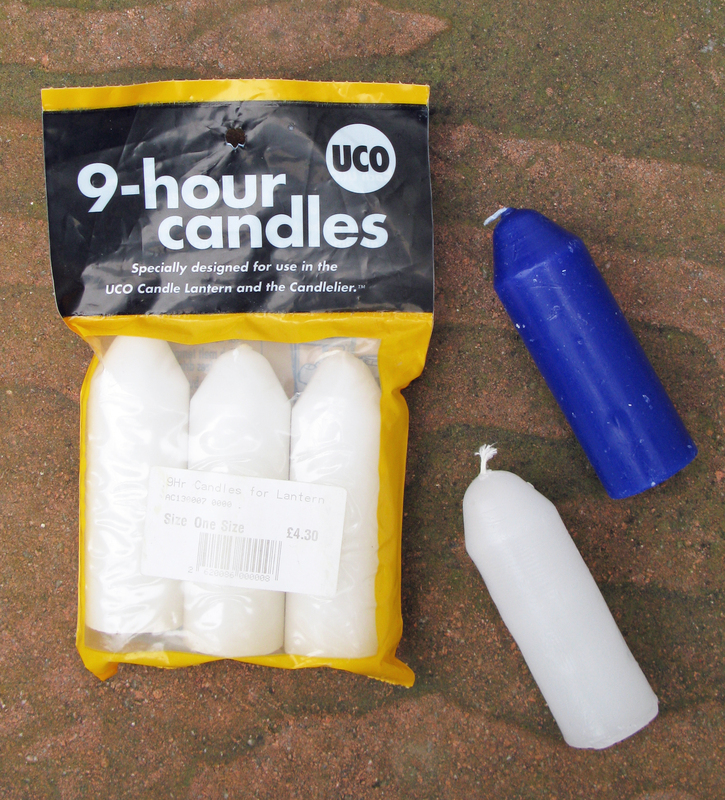 As a demonstration on practicality, when John Merrill completed his ten month, 7000 mile circumnavigation of the British coastline in 1978, he went through thirty Blacks’ ‘longlife’ candles for both cooking and lighting, each burned for eight hours and Merrill believed them better than torches. Not that he did much night hiking of course. The candles are designed especially for these lanterns and it is possible to buy different types. The standard candle burns for around nine hours. There are also blue citronella candles that also burn for around nine hours but give off a slight scent that, in theory, discourages the mozzies, midges and whatever. Another alternative are the beeswax candles. These burn cleaner than the wax candles and for longer too- 12 to 15 hours. Candles weigh around 50g each. 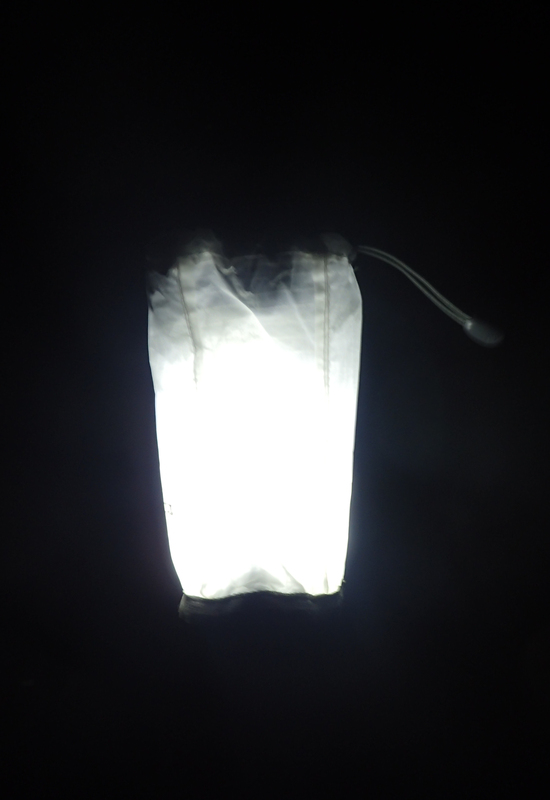 Another factor to be considered with these lanterns is that they actually reduce condensation in a tent. I have never used the smaller Micro UCO tea light candles. While potentially offering similar advantages I have heard of too many stories on how easily these spill molten wax everywhere compared to the relatively stable and apparently safer Original model. Weight with candle is 201g. Dimensions are 180mm x 50mm when open and 120mm x 50mm when closed, though I keep mine in a 45g neoprene cocoon for safety. The removable LED in the base weighs another 17g. On occasion I have also used a 28g Pac-Flat reflector. This is a two part reflector that slots together in use to form a shallow cone that slides down to the top edge of the lantern and reflects light downward. Useful when the lantern is hanging above. 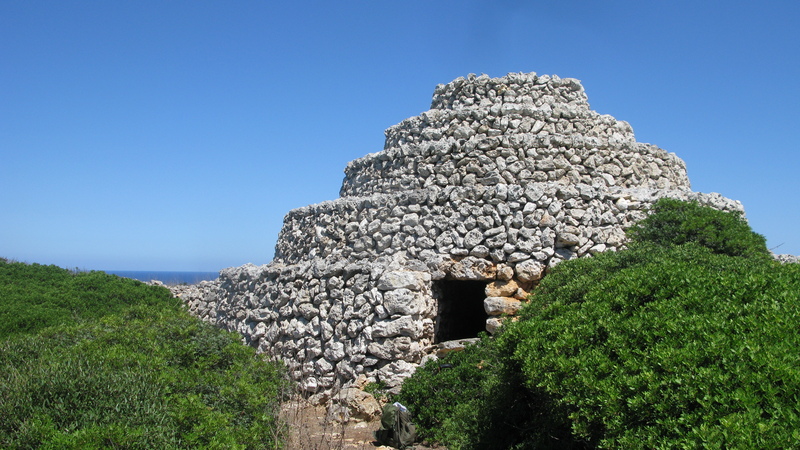 It can be seen in use in an image below. 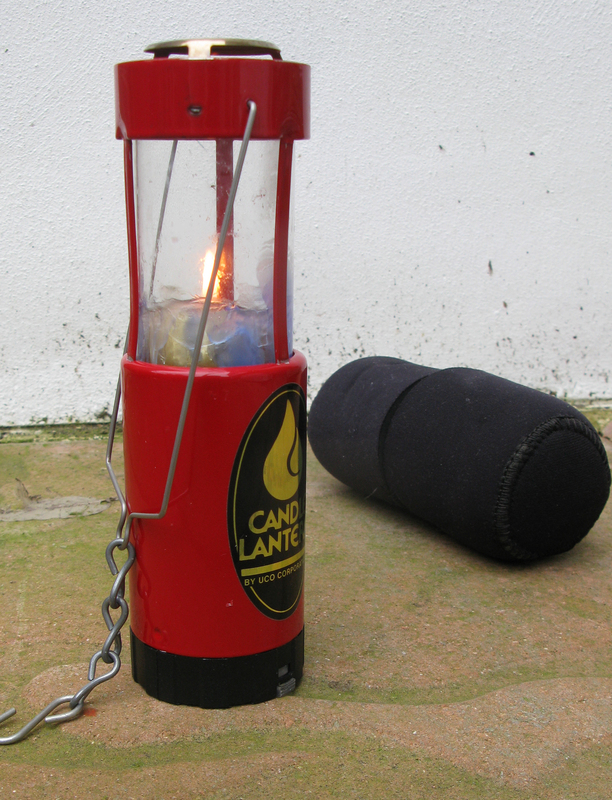 This is a virtually unbreakable lantern with a built in piezo ignition (that often fails to work properly). Weighing 121g, it measures 61mm x 62mm x 106mm so is pretty compact. Instead of a glass globe to protect the mantle, it is fitted with a stainless steel mesh globe. It comes with a metal hanger with a hook on to hang from the roof of a tent and has a tiny nylon stuff sack (10g) in which it can be stored. 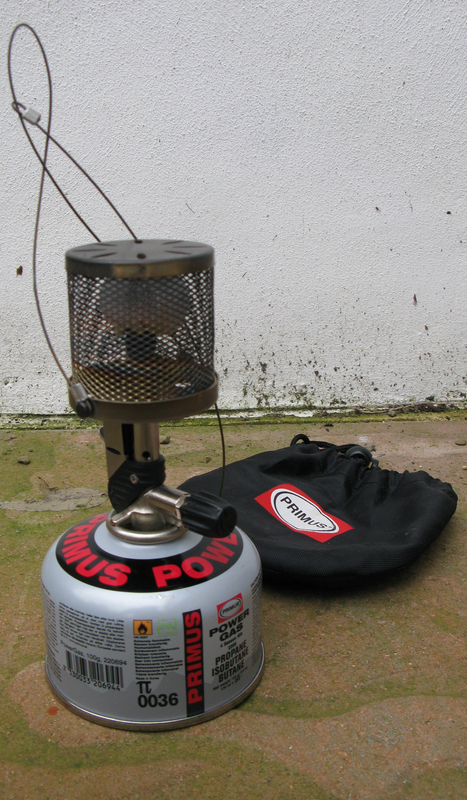 Alternatively it can be kept in the small neoprene cocoon used for the UCO lantern (though not both at the same time) The lantern is powered by screw in LP-gas 70/30 butane/propane gas cartridges. While it could take just about any of the sizes available, I tend to use the small 100g carts. It is possible to alter the light intensity up to 70W (235 lumen). A bit of heat is knocked out too. While not noisy, the hiss is certainly noticeable and I quite like the sound on a blustery, wet night. As usual, despite the flame being enclosed, great care has to be taken. Another recent entry in to my ditty bag has been the rather excellent little Mont Bell collapsible lantern. 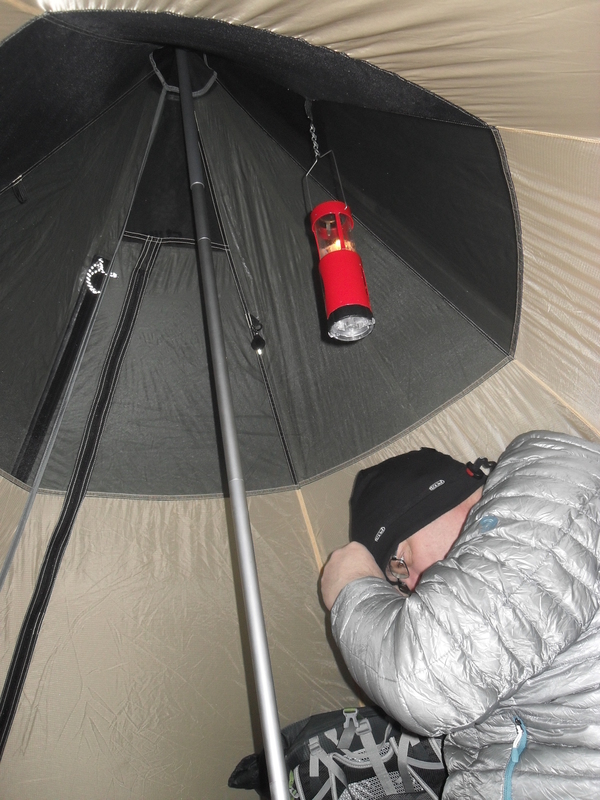 This provides an effective cross over from head-torch to tent lantern. Well worth both the expense and few grams that it costs. 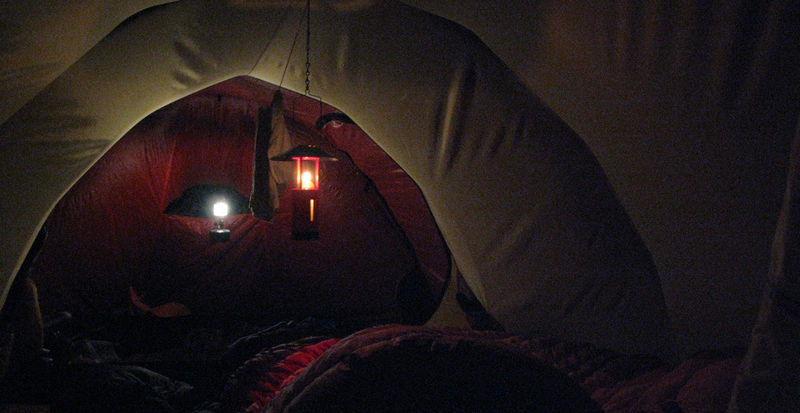 The mouth of the 30 denier rip-stop polyester lantern is tightened around a head torch suspended from the roof, the material then spreads and dissipates the beam in a pleasant spread of light. A very effective piece of kit. A bit of a luxury I know, but at only 4g, one I am sure many can accept. 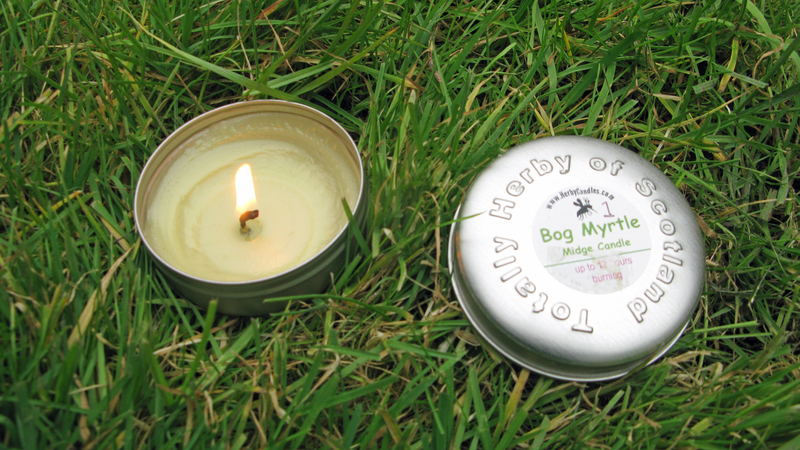 It is also possible to buy small tins containing wax candles infused with citronella, bog myrtle or other natural ingredients. The spin is that these will help ward off midges and the like. This may be true, however even while having one of these burning in a tent door on the Isle of Skye, there seemed to be plenty of midges to go round so their actual effectiveness is uncertain. But, small, pretty light and very convenient, they undoubtedly also give off a little light and warmth.